On May 3rd, 2012, Disneyland came up with another way to incorporate its Festival Arena into usable space for the summer season. 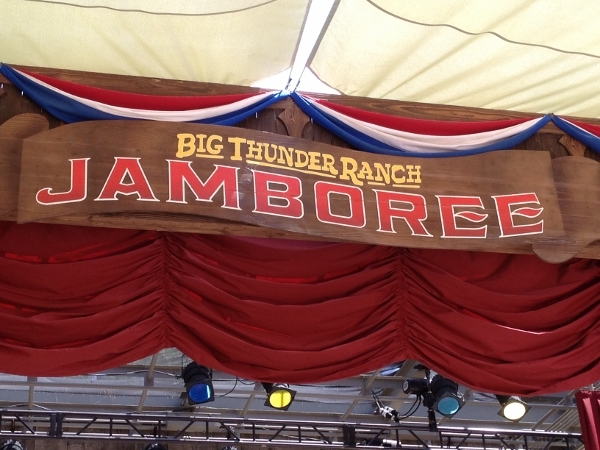 They did what now seems to be the obvious thing; since the entrance to the Arena is at the back of the Big Thunder Ranch -they opened it up as the Big Thunder Jamboree! Now what exactly does a Jamboree entail? 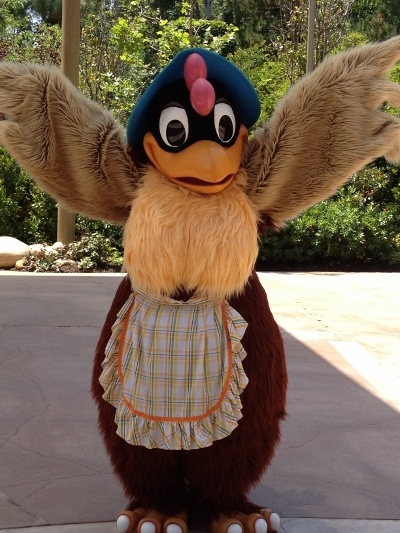 I’ll give you our impressions as we spent a few hours with Clarabelle Cluck, just taking in the experience! 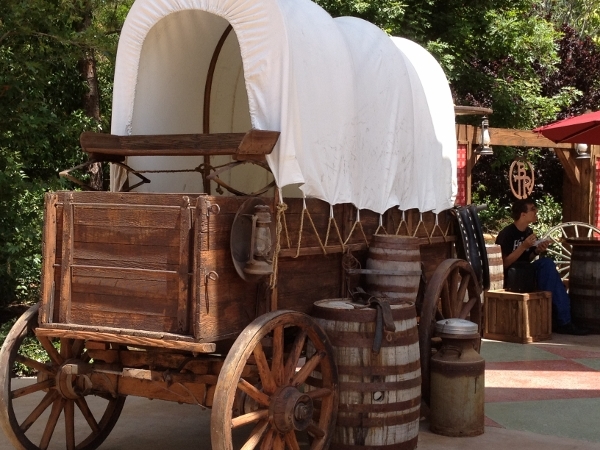 Like I said, the entrance to the Jamboree is in the back of Big Thunder Ranch. 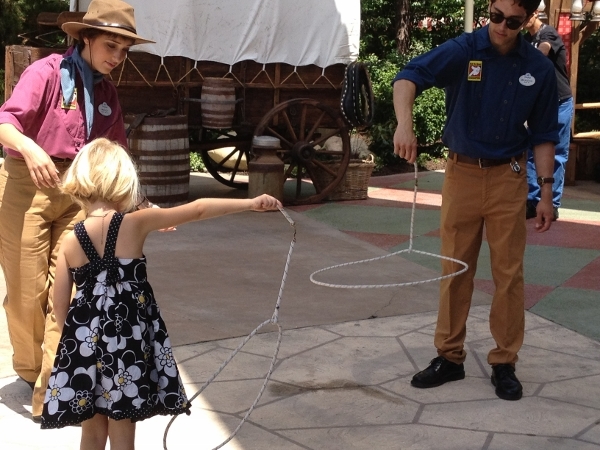 Just head to the back of Frontierland and you’ll walk right into it! The area is spacious, with an amazing amount of shade to be had. 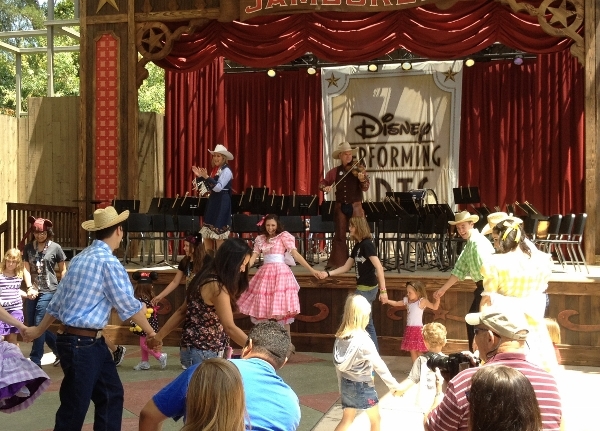 There’s ole’-time music playing and plenty of activities throughout the day. You’ll find shows and student performances, exhibits of “western-style” crafts – woodcarving and quilting, character meet and greets, lasso twirling, and a couple of snack vendors (remember not to take those goodies out of the Jamboree and into the Ranch proper, for safety of the animals). 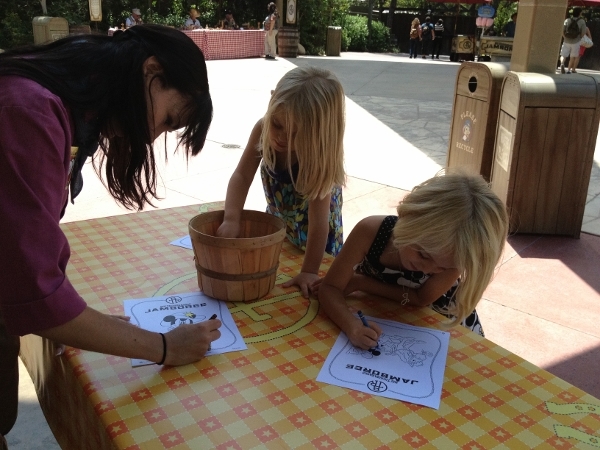 By the grandstand, there are plenty of benches for watching the shows and picnic tables for coloring pictures of Minnie and her horse. Let’s talk about the stage area first. As many of you know, the Carnation Gardens was home to the Disney Performing Arts program. Schools and groups came from all over the country to perform on that stage. With the Gardens closed permanently for refurbishment, the Jamboree arena was the perfect place to host the program. When we arrived, they were just setting up for an amazing high school symphonic band. 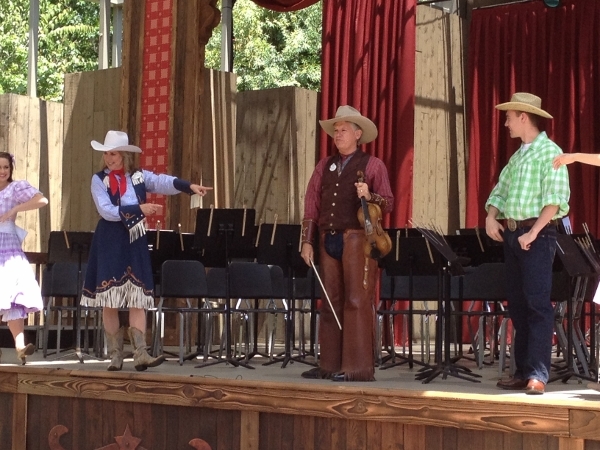 Then, at 12:30pm, we were treated to the Cowboy Roundup, starring Frontierland’s own Fiddler Farley. 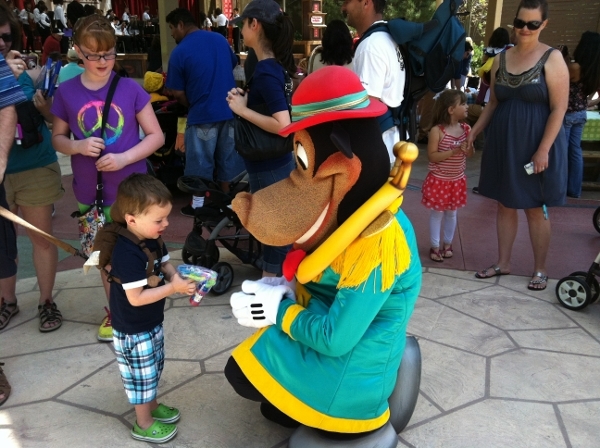 He’s been bringing his brand of string-tickling entertainment to Disneyland for over 20 years! Guests aren’t the only ones that come out to hear Farley play. Mickey and Minnie can be found enjoying Farley and the dancers off to the side of the stage until the second part of the show. The second half is when the show moves off the stage and down front for some audience participation. 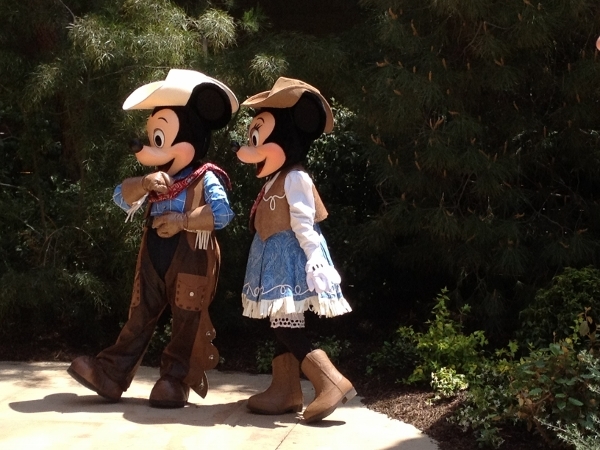 Guests are invited to join them for a good old fashioned hoedown, complete with square and line dancing. We didn’t go up, but the folks that did seemed to have a great time! 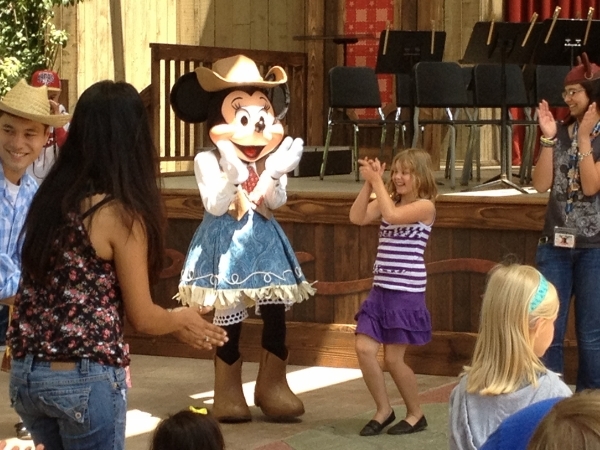 This is the point in the show where Mickey and Minnie get a chance to have fun with the guests! If you want to catch the Cowboy Roundup, make sure you check the Daily Times Guide. It currently takes place twice a day on the weekends and, at the time of this writing, the schedule is Friday and Sunday at 12:00pm and 2:15pm, and on Saturday at 11:30am and 1:45pm. 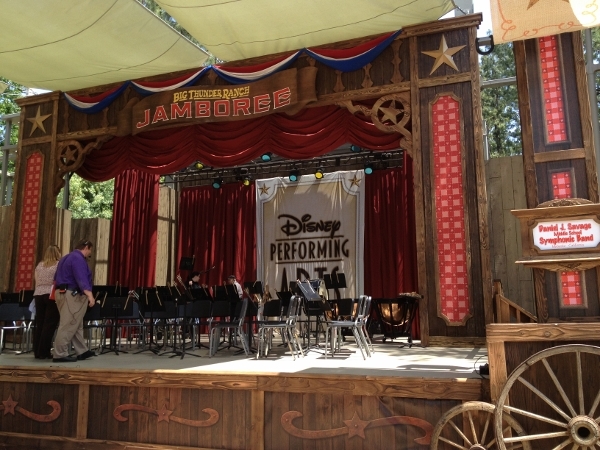 We also heard a bit of gossip that Billy Hill and the Hillbillies may be moving out to the Jamboree in mid-June, so keep an eye out to see if this happens. 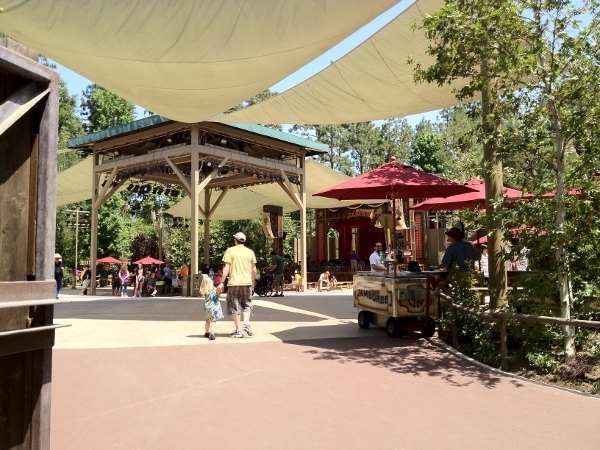 That will definitely be a perfect addition to this area and will change the schedule of show times. After the show, we decided to check out the Jamboree’s other offerings. You can’t help but notice the decor. 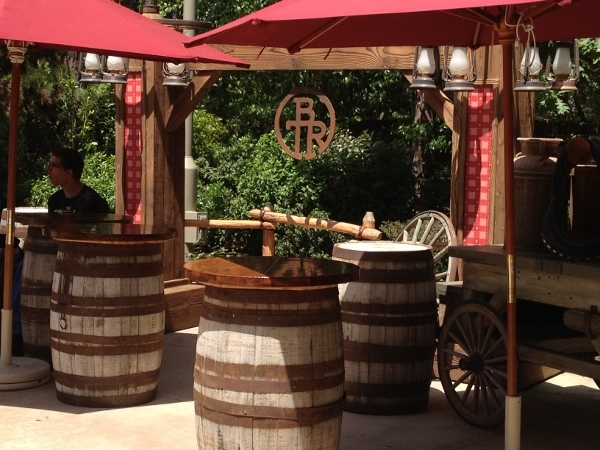 The area is surrounded by the branding symbol of Big Thunder Ranch, old oak barrels (made into tables), carts with milk cans, and all those lanterns to really make the area glow at night. There’s even a Conestoga wagon to grace the area and remind us of exactly how our ancestors moved across the country to settle in the “new territories”. For me, its presence brings up a great discussion on how we are spoiled with our luxurious, modern-era transportation. Answer honestly: If you and your children had to spend as much time as the pioneers did living couped up in that small of a space, who would lose their patience first? I think I would! The Conestoga made a perfect backdrop for two other activities that help the pioneers survive the trip west; lassoing and quilting. 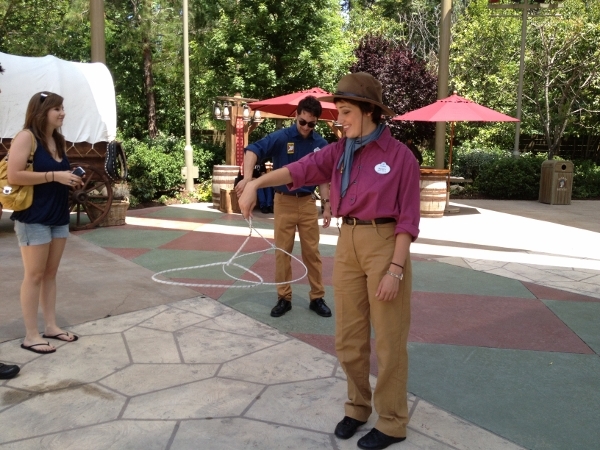 Cast Members seemed to have a great time “roping folks in” to learn to spin a lasso. My oldest even stepped up and did a pretty decent job for a little city girl! 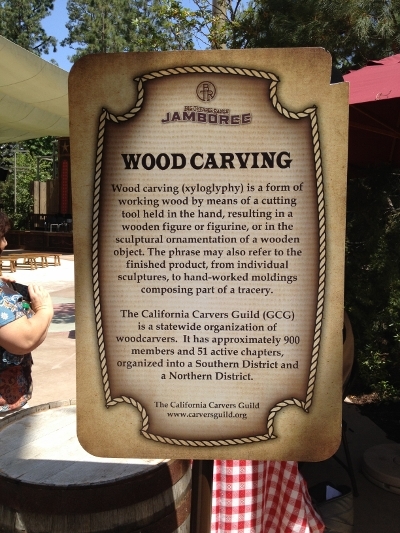 When we explored the demonstration areas, we found a great explanation of woodcarving – a craft that has been long forgotten by most Americans, but a necessity in the history of western expansion. The gentlemen working before us talked about the carvings they had on display. 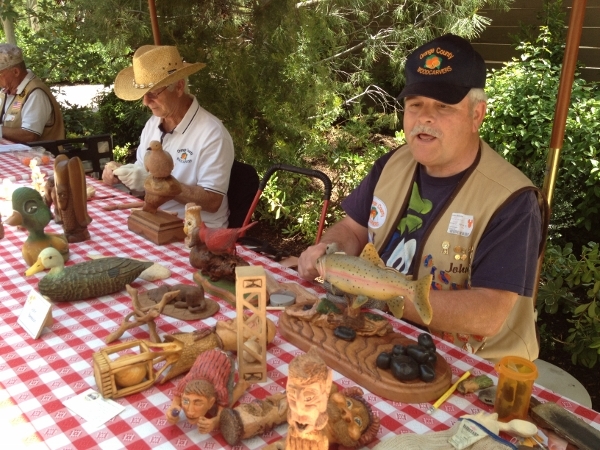 The gentleman in the cowboy hat took time to explain the various types of woods, as well as the challenges that they presented to a woodcarver. He even had samples that we could handle, to truly understand his comments. 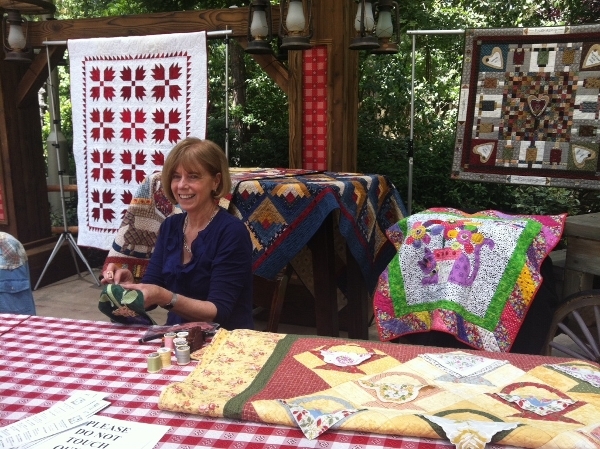 We then moved on to the quilting demonstration. 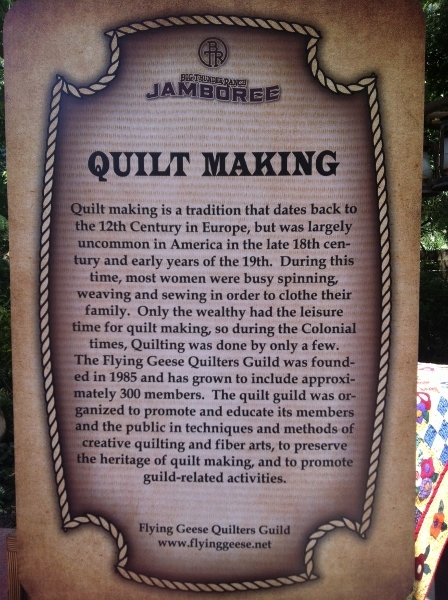 Their sign introduced us to the history of quilt making. These ladies had a number of traditional and modern quilts on display and talked with guests about how quilting has adapted with the introduction of technology. The woman below was demonstrating the hand sewing techniques used by the pioneers, while another demonstrated the use of sewing machines in reducing the time spent on crafting these family heirlooms. They also explained how to identify the difference in techniques and the corresponding quality and value, when buying one that is already made. Handmade ones are quite a bit more expensive, so you need to learn the difference in the quality of the sewing. 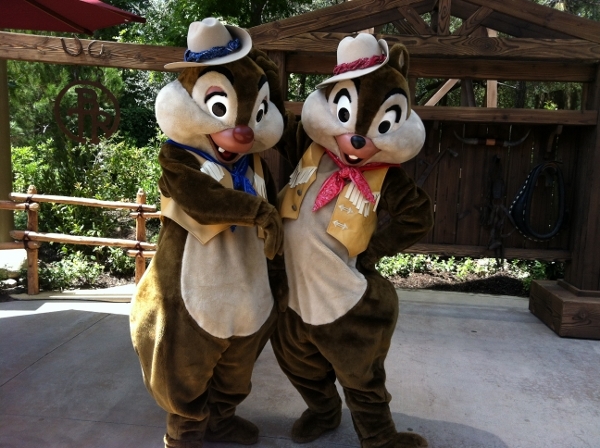 Even Chip and Dale were on hand to say Hello! 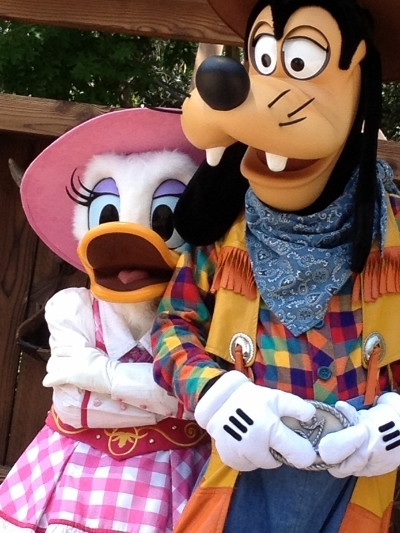 This might be a good point to take a cue from Goofy and Daisy, so I think I’ll bid a fond farewell to the Big Thunder Jamboree and ride off into the sunset. Photos by N. Johnson and M.J. Willey. Mater’s Junkyard Jamboree: These Tractors are Tippin’ the Light Fantastic!